In the world of casting and welding technology, VAUTID has been the leading name in metal wear protection for over 70 years. Our innovative family of products, such as VAUTID V100, set the standard for the industry right around the world. As specialists in system solutions, we help operators and manufacturers to develop an integrated approach to minimizing wear – thereby building a solid foundation for the long-term operation of industrial plant and machinery. Our comprehensive portfolio of high-quality VAUTID products enables us to offer our customers complete wear solution packages, and we pride ourselves on the standard of our global support services. design capabilities, we develop complete systems solutions for our customers. We provide integrated, customized solutions to wear problems. This means we fine-tune our designs to match the precise requirements of the industry and the application. And we handle everything ourselves – from consultation and design to research and development, and from the finished product to the appropriate follow-on services. So every VAUTID system solution will prove its worth from both a technical and a commercial standpoint, ensuring optimal performance under the demanding conditions of continuous operation. We develop and implement individual solutions for our customers, using our comprehensive portfolio of VAUTID products. Our engineers analyze the demands on the equipment or machine. Then they produce a comprehensive report and develop designs for all steel components at risk of wear. By selecting the appropriate VAUTID materials, these components can be best protected against abrasion, impact, and chemical or thermal corrosion. This is how VAUTID know-how drives down wear costs and ensures maximum service life. 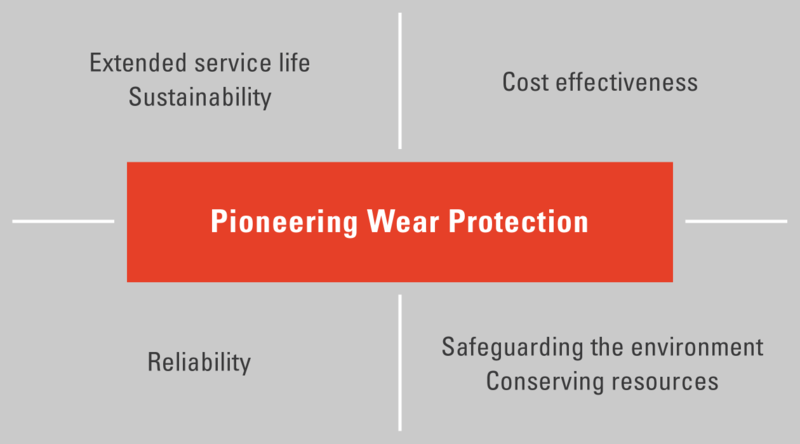 With more than 70 years of wear protection experience and our commitment to remain a leading innovator, we at VAUTID are constantly developing new metallurgical and design solutions to the problems of wear. To this end, we carry out microstructure examinations, hardness testing and other analyses in the wear laboratory. 3D CAD design facilities, prototypes and solidification simulation programs are all used to get our products market-ready as quickly as possible. In addition, our collaborations with universities and other institutions mean that we are constantly developing valuable new specialist knowledge for the benefit of our customers. As specialists in providing all-round wear protection, we produce all our materials in our own facilities around the world. Here we combine top-quality raw materials, careful workmanship, modern process technology and the knowledge and commitment of all our employees to create original VAUTID products. We continue to develop additional international manufacturing sites, constantly positioning ourselves to meet the demands of our customers and moving ever-nearer to their markets and their needs. All VAUTID deposition welding materials, composite wear plates and cast products are produced in accordance with the strict requirements of ISO 9001. This means we can guarantee the standard of all VAUTID products to all our customers around the world.